A proposed personal finance course for Quebec high school students is pitting teachers unions against the government and a financial industry that want people to be more comfortable managing — and talking about — money. A proposed personal finance course for Quebec high school students is pitting teachers' unions against the government and the province's financial industry. 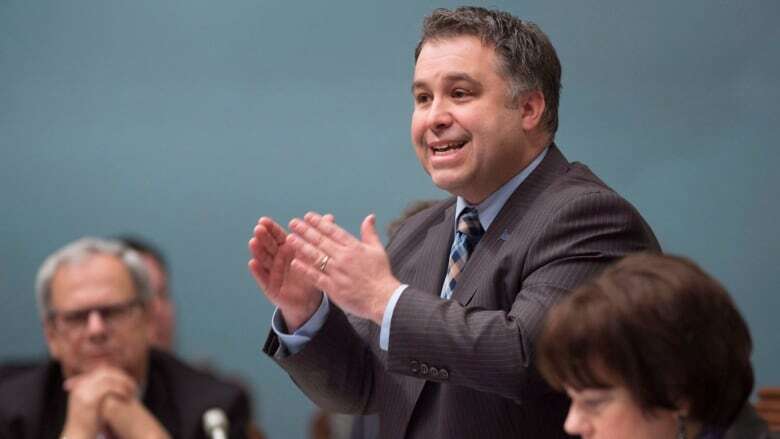 Education Minister Sébastien Proulx wants the personal finance course to be mandatory in high schools across the province, starting September, while unions are demanding he suspend the roll-out. "Certainly the introduction of a class like this is not in line with our philosophy of education," said Sébastien Joly, president of the Quebec Provincial Association of Teachers. "It's coming from the financial groups, bankers, and what not... We have more of a liberal view. You're supposed to acquire knowledge that would open your horizons and help you from a critical standpoint." Sylvain Mallette, head of Montreal's largest teachers' federation — the Fédération autonome de l'enseignement (FAE) — is less diplomatic. "This class was concocted by the banks," he said in various interviews. "How do we know the material that is being imposed won't include marketing for the banks' financial products?" The course would teach students in their last year of secondary about consumer rights and regulations as well as the concept of supply and demand. They would also learn about taxes and interest rates, how to manage credit cards and how to sign leases for apartments and cellphone contracts. Unions say their main objection is they weren't property consulted before the minister decided the course would be mandatory. But there are also concerns the material doesn't encourage enough critical thinking about capitalism and the global financial industry. Teachers' unions say the course is a product of a larger provincial strategy to change Quebec culture regarding money — an initiative being led by the province's securities regulator, the Autorité des marchés financiers. The regulator heads a "financial education" advisory committee, which includes representatives from the education and finance departments and other government agencies, as well as from Desjardins Group, National Bank, Bank of Montreal and Sun Life Financial. Its 2016 report cites concern that Quebec household debt is reportedly close to 150 per cent of income. Curiously, it also discusses how "many claim that Quebec society and its francophone majority are still influenced by certain refractory values about money, particularly Judeo-Christian values that have affected many generations." The report continues by saying "in many ways, our relation with money still distinguishes us from Canadians in other provinces." Additionally, the report suggests a priority should be to "encourage Quebecers to talk more about money, finances and the economy." Joly said he doesn't disagree that Quebecers have had aversions to talking about money but says the report is not completely fair. "This is a historical fact that francophones from a Catholic background were less comfortable talking about money," he said. "But in a broader perspective, I think in the past 10 to 15 years, it has become less of a problem." Bryan St-Louis, a spokesman for the Education Ministry, said in an email the department, in preparing the course, discussed the contents with a variety of partners, including the financial industry. Rina Marchand, who works for a private non-profit foundation on entrepreneurship, says younger Quebecers are moving away from old stereotypes and are thinking more about starting businesses. She pointed to a survey by the Leger polling firm, HEC Montreal and the National Bank indicating that 42 per cent of Quebecers between 18 and 34 were thinking of becoming entrepreneurs in 2016. Among all Quebecers, the poll suggested 21 per cent said they were looking to start a business, up from seven per cent in 2009. Marchand credits the media, in part, for the change. "There is more of a balance covering entrepreneurs," she said. "They aren't only covering bankruptcies but also nice success stories." But Marchand cautions there is a lot more work to do because only five per cent of all those between 18 and 34 actually ended up starting a business.